Is taking medicine a sin? No, doctors and the medicine they provide are to be seen as God’s blessing. Luke who was a disciple, was a doctor as well. Taking medicine does not mean that you’re not putting your trust and faith in Christ. God can use medicine to heal us. We live by faith and not by sight. God is always behind the scenes working. Pray that God will heal you. Trust in Him alone to help you and always remember to use never abuse. Prayer is the best medicine. 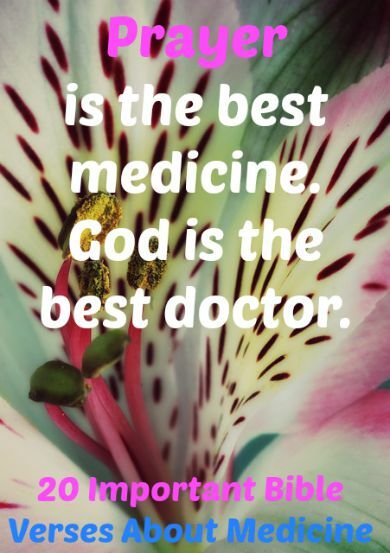 God is the best doctor. 1. Jeremiah 8:22 Is there no medicine in Gilead? Is there no physician there? Why is there no healing for the wounds of my people? 2. Ezekiel 47:11-12 Yet its swamps and marshes will not be healed; they will be left for salt. All kinds of trees providing food will grow along both banks of the river. Their leaves will not wither, and their fruit will not fail. Each month they will bear fresh fruit because the water comes from the sanctuary. Their fruit will be used for food and their leaves for medicine. 3.Revelation 22:2 It flowed down the center of the main street. On each side of the river grew a tree of life, bearing twelve crops of fruit, with a fresh crop each month. The leaves were used for medicine to heal the nations. 5. 2 Kings 20:7 Then Isaiah said, “Make an ointment from figs.” So Hezekiah’s servants spread the ointment over the boil, and Hezekiah recovered! 6. Jeremiah 51:8 But suddenly Babylon, too, has fallen. Weep for her. Give her medicine. Perhaps she can yet be healed. 7. Isaiah 1:6 You are battered from head to foot— covered with bruises, welts, and infected wounds— without any soothing ointments or bandages. Alcohol was used as medicine. 8. 1 Timothy 5:23 Don’t drink only water. You ought to drink a little wine for the sake of your stomach because you are sick so often. 9. Luke 10:33-34 Then a despised Samaritan came along, and when he saw the man, he felt compassion for him. Going over to him, the Samaritan soothed his wounds with olive oil and wine and bandaged them. Then he put the man on his own donkey and took him to an inn, where he took care of him. 10. Proverbs 31:6 Give strong drink to the one who is perishing, and wine to those who are bitterly distressed. People went to doctors in the Bible. 12. Colossians 4:14 Luke, the beloved doctor, sends his greetings, and so does Demas. 13. Job 13:4 You, however, smear me with lies; you are worthless physicians, all of you! 14. Genesis 50:2 Then Joseph told the physicians who served him to embalm his father’s body; so Jacob was embalmed. Continue to trust in the Lord, He is the one who really heals. He just does it behind the scenes. 15. Psalm 103:2-3 Bless the Lord, my soul, and never forget any of his benefits: He continues to forgive all your sins, he continues to heal all your diseases. 16. Job 5:18 because though he wounds, but then applies bandages; though he strikes, his hands still heal. 17. Psalm 147:3 He heals the brokenhearted, binding up their injuries. 19. Proverbs 17:22 A joyful heart is good medicine, but a broken spirit dries up the bones. 20. Ecclesiastes 3:3 A time to kill, and a time to heal; a time to break down, and a time to build up. Previous: How Do You Find Peace And Rest?